THE WATERMELON MARGARITA IS THE BEST REFRESHING SUMMER COCKTAIL. WITH JUST A HANDFUL OF INGREDIENTS THIS RECIPE COMES TOGETHER IN MINUTES AND IS A SEASONAL PARTY FAVORITE. 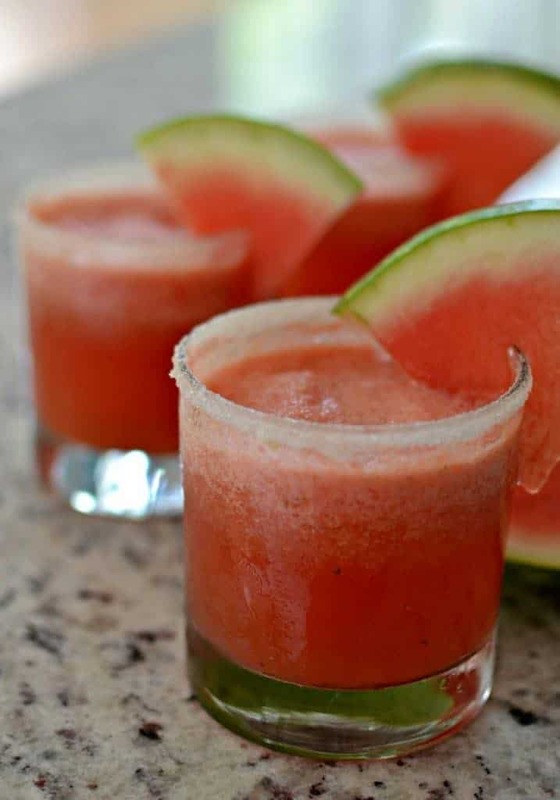 The sweet taste of watermelon really shines through in this cocktail recipe! Summer is not quite over and there are still plenty of sweet watermelons in the fruit stands and markets. 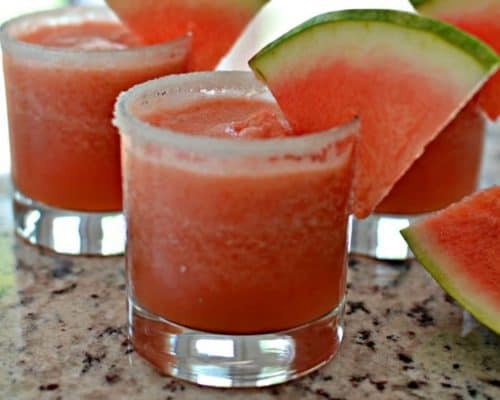 In addition to that there are still plenty of evenings and weekends to enjoy this delectable Frozen Watermelon Margarita. With just a handful of ingredients, a blender and some frozen watermelon you can be the hostess or host with the awesome cocktails. WHY YOU SHOULD USE FROZEN WATERMELON FOR YOUR MARGARITAS. Watermelon flash freezes very well and very quickly. For this recipe be sure to purchase a seedless watermelon. Simply cut it into bite size chunks and place on a nonstick baking sheet in the freezer until frozen. This step really ensures that your margarita will have a ton of watermelon flavor and not be watered down with melting ice. 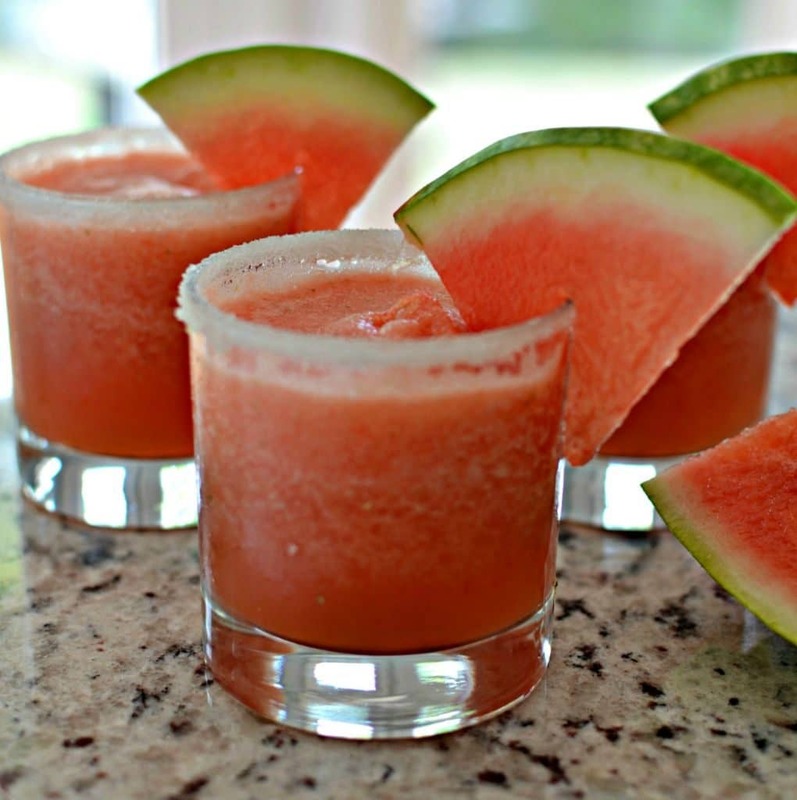 See how tasty and refreshing those Watermelon Margaritas look? They are perfect for your next summer soiree, shindig or pool party. HOW TO MAKE A WATERMELON MARGARITA. Prepare ahead of time by flash freezing the watermelon and making the simple syrup. To flash freeze watermelon remove from rind and cut into chunks. Lay in single layer on nonstick baking pan and place in freezer. When frozen place in Ziploc freezer bags for now and future use. To make simple syrup add sugar, water and lime zest to a saucepan over medium heat and stir until sugar is dissolved. Place in refrigerator to cool. Using a lime wedge run the rim of each glass with lime juice and dip into shallow plate of sugar or salt depending on your preference. Right before serving add lime juice, simply syrup, frozen watermelon, and tequila to blender. Add ice to blender if needed. Pour in rimmed glasses and serve with a small wedge of watermelon as garnish. This big bold flavorful cocktail is a hit at any party or Friday night evening nip. Grab that big beautiful watermelon before summer has passed so that you can make yourself a refreshing Watermelon Margarita. OTHER COCKTAIL RECIPES YOU WILL LOVE! Watermelon Margarita is the best refreshing summer cocktail. With just a few ingredients this recipe comes together in minutes and is a party favorite. Remove watermelon from rind and cut into bite size pieces. Place on nonstick baking sheet and place in freezer. In small saucepan over medium heat add water sugar and lime zest. Cook until sugar dissolves stirring frequently. Cool completely. Rim glasses with lime wedge and dredge in sugar or salt. 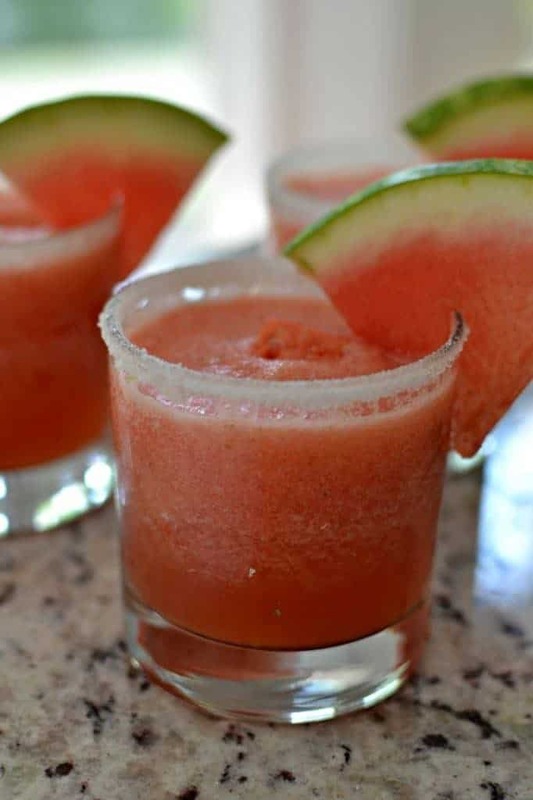 Add frozen watermelon, simple syrup, lime juice and tequila to blender. Blend just until smooth. Pour into rimmed glasses and garnish with small watermelon wedge.